I have had the privilege of connecting with a variety of animals and they have so much to share with us – beautiful, insight things that can enrich their lives and ours . I have a particular affinity with horses and dogs and find I often get accosted on the beach when a dog has something to say! Horses are particularly discerning about who they want to let into their inner world. A session usually takes about 30 mins – some horses are have lots to share and others find it hard to tolerate people in their space for long. It’s up to the horse and they certainly let me know when they have had enough. Some horses are happy with remote connections – others not so much. I prefer to be in their physical space when i first connect if possible, after that they know who I am and are usually happy to connect remotely. If you are in the Waimauku, Kumeu, Taupaki area I don’t charge travel costs so it’s $50. If your horse decides that they don’t want me in their space then there is no charge of course. 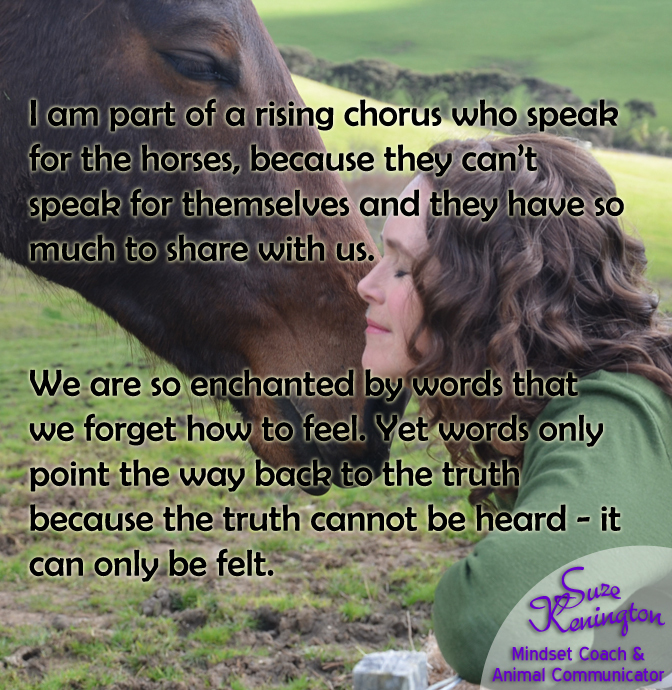 If this feel right for you and your horse then please fill in the Animal Communication Registration Form. I look forward to meeting you and your horse.